With its iPad, Apple continued to enjoy a commanding lead over the worldwide PC market in units shipped during the second quarter of 2013, but second place Lenovo gained some ground on strong tablet shipment growth. According to Canalys, a market research firm that considers tablets in its PC shipment estimates, Apple owned a 17.1 percent share of the PC market in quarter two with 18.6 million units shipped. However, the Cupertino, Calif., company saw negative growth of 11.5 percent from the same period in 2012, which resulted in an over two point drop in marketshare. Canalys saw No. 2 Lenovo creep up on Apple with 14.1 million units shipped, good for 12.9 percent of the market. Units shipped was up 7.3 percent from the year ago quarter. In addition to gaining share in the notebook and desktop categories, Lenovo was able to also grow in tablets. "It is striking how successful it has been in globalizing its PC business and breaking the 1 million unit barrier is an important milestone for its tablet shipments," said Canalys analyst James Wang. "Lenovo is on an upward curve with its tablets, expanding in mainland China and Latin America, where there is little competition from the likes of Google or Amazon." Coming in third with a revamped tablet strategy was HP, which regained the spot from Samsung on 12.7 million shipped units for an 11.6 percent share of the market. Samsung trailed in fourth with 10.8 million units for 9.9 percent of the market, while Dell ended in fifth place with 9.5 million shipments and an 8.7 percent marketshare. 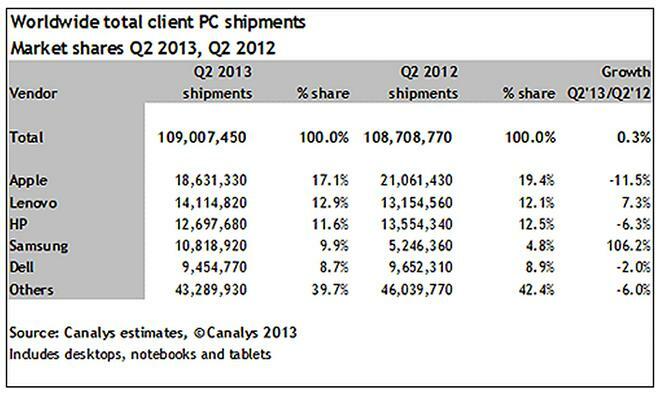 Overall, the PC market grew slightly year-over-year at a rate of 0.3 percent with just over 109 million total shipments. Although Apple's iPad shipment growth rate may have slipped, the company is still seen as raking in the most profits from its tablet sales. The continued profitability of the iPad is crucial to Apple, especially considering Canalys estimates regarding Mac shipments, which reportedly accounted for only 20 percent of the company's PC shipments for the second quarter.